September 11, 2018--Just finished the stitching on this delightful CyberPointers project. The colors used came from an overdyed RG Mandarin Floss thread and would not normally have been my first choice--way out of the box for me. I'm going to call this "Canyon" Heart since the colors make me think of the way canyons look at different times of the day. It's interesting how the center color played out on the overdye, clumping the yellow in one place. Do you think of a sunrise or late afternoon sun? What do you see? 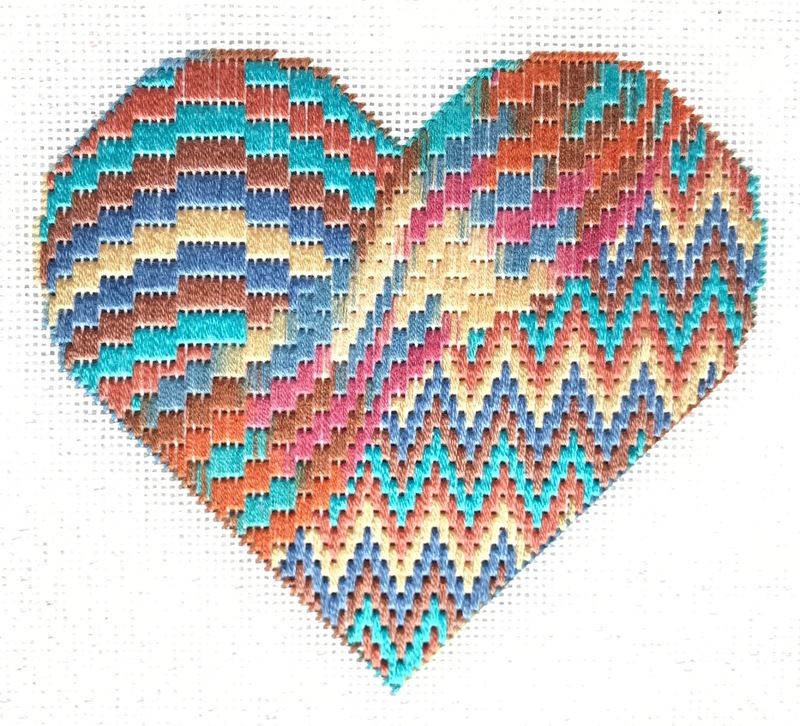 September 9, 2018--As a member of ANG's CyberPointers online chapter, I love stitching their meeting offerings whenever possible, and because I love bargello stitches, this month's project is a must do for me. The project called Florentine Heart is designed by Patricia Tector, and uses an overdyed thread from which 5 different thread colors are drawn, all taken from your own stash. Years ago I received an RG Mandarin Floss M924 overdyed thread at an ANG NOVA chapter event as a table favor and have always wanted to use it somehow. 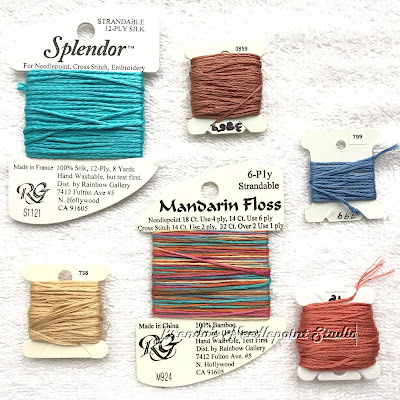 This strandable bamboo floss, along with four matching DMC threads and an RG Splendor thread are perfect for the Florentine Heart--at least I think so as of this point in the project. 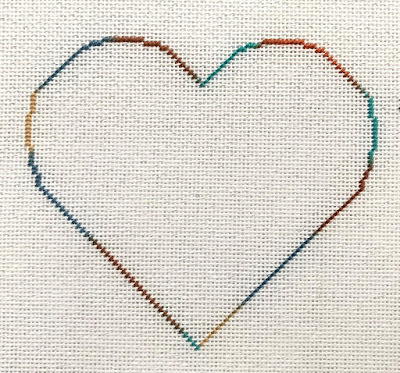 I have thus far completed the instructions for Day 1 and below is a photo of the heart outline along with my thread choices. Now onto the instructions for Day 2. 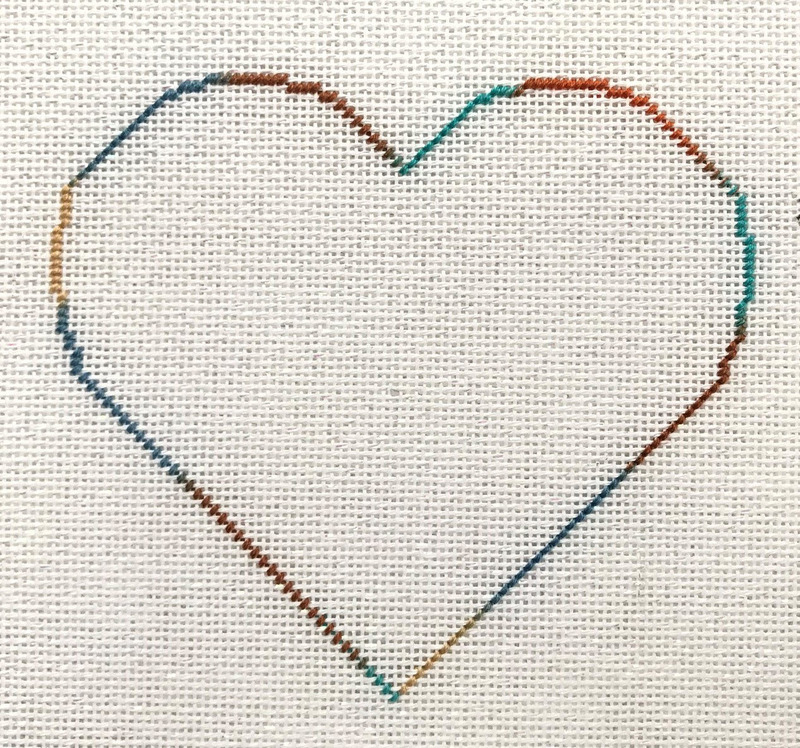 PS The heart outline was copied from another project that had the stitches already graphed--all I had to do was count out each section. I found this preferable over tracing a heart design on the canvas and figuring out where to place the tent stitches. I'm either very lazy or an extreme genius--or both. LOL. Your heart should be very pretty with these colors. And counting is the only way to go! I fear those who try to trace that heart are going to have problems. Brenda, I love how your heart turned out. You are right how interesting the results can be when you stitch with an overdyed thread. I like your name for this heart because I have seen the colors you talk about when I have been admiring a canyon. I think that it is sunset because the colors remind me of what I see at that time of day. Thank you so much for sharing! The comment above was from Patricia Tector. Thank you so much for your nice comments. Your project is beautifully designed and was a lot of fun and quick to stitch. I like the colors of your heart. My threads are all pulled. . . but no stitching done yet! I think the fortuitous placement of the yellow makes the whole piece so interesting. Love it. Hi Kathie. Thank you for your comment. Sorry, but I don't know if Patricia Tector is offering this as a class elsewhere.